Zhu Kai has been losing a lot of sleep since the start of this year's FIFA World Cup finals in South Africa - although he is more worried about the amount of money he has lost. 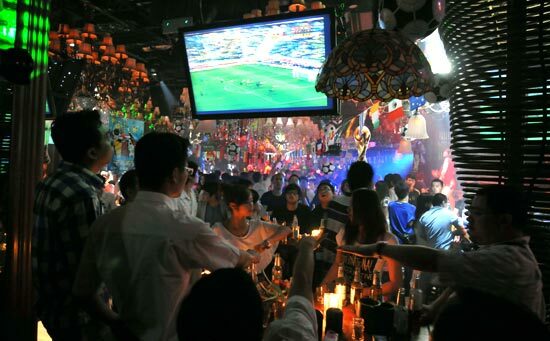 Like many die-hard soccer fans, the 31-year-old Zhu, who did not want his real name to be used, has been a fan of online gambling for years and said it "adds a real thrill" to his World Cup experience. With the click of the mouse, he wagers his hard-earned cash on how many goals will be scored in a match, which team will hit the net first and who will be the first player on the score sheet. Raising the stakes helps create the "perfect level of suspense" for any match, said Zhu, who works for a State-owned company in Nanjing, capital of Jiangsu province. Of course, it is not just the excitement that attracts him to online gambling but the easy money that can be made - if you are lucky, that is. "Gambling is something interesting that also potentially offers quick returns," said Zhu, who readily admitted there is also huge risk involved. He lost 40,000 yuan ($5,800) in the 2006 World Cup final when Italy beat the favorites, France, in a penalty shootout. "I think I'm going to get even this time," he added, repeating what is possibly the hardened gambler's mantra. Zhu is among tens of millions of sports fans in China whose interest goes well beyond the matches to the huge potential profits of gambling. The money wagered on soccer matches alone is estimated to be more than 1 trillion yuan every year, said Zhang Lu, vice-chairman of Beijing Guoan Football Club. However, most of this money is flowing out of the country as sports betting is still outlawed in China. The only gambling allowed on the mainland is through a handful of sports lotteries endorsed and run by the government, which means Chinese people must turn to websites based abroad, where online sports betting is already a legal and highly profitable industry. According to Titan Sports Weekly, China's most influential sports newspaper, Chinese soccer fans spent up to 500 billion yuan on online gambling during the 2006 World Cup finals in Germany - roughly 2 per cent of China's GDP. Sports betting analysts expect this year's month-long tournament will generate just as much money for bookmakers, or "bookies" as they are often referred to, with overseas websites and underground gambling rings set to be the biggest winners. To curb rampant sports gambling in China, which authorities believe "disturbs the country's social and economic order", the Ministry of Public Security in February launched a nationwide six-month crackdown in cooperation with seven other government departments. As of June 4, the week before the World Cup began, police had uncovered more than 670 cases of online gambling and blocked access to 26 overseas sports betting websites, show figures released by the ministry. Almost 600 million yuan has already been seized during the crackdown, said ministry officials. The campaign is also focused on preventing underground banks and third-party payment platforms from providing services for underground and overseas gambling rings. Overseas betting websites have already started to feel the chill. Many sites have closed their businesses in China after seeing their money supply severed by the police and banks, who have both stepped up efforts to stop payments going to cyber casinos. The crackdown also coincides with the government's efforts to fight corruption in the country's football leagues, where match fixing is already believed to be a major problem. 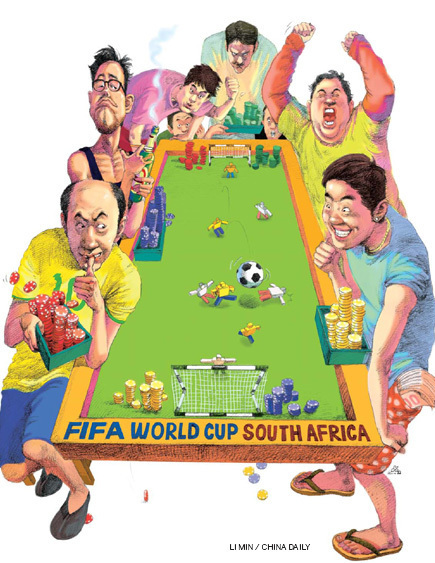 Official investigations found that leaders of underground gambling rings are offering soccer players large sums of money to perform badly during games. Three high-ranking officials with the Chinese Football Association - vice-chairmen Nan Yong and Yang Yimin, and Zhang Jianqiang, former director of its referee committee - and three former referees were also arrested this year for allegedly taking bribes and helping to fix matches. All these seemingly successful crackdown campaigns, however, have only revealed the tip of the iceberg, warn gambling experts. Despite the ironhanded crackdown, eradicating illegal gambling is still very difficult, with underground rings continuing to thrive by offering better odds and extending credit to punters. For avid gamblers like Zhu, the Chinese sports lottery, which was introduced in 1989 mainly to raise funds for sports programs, suffers from a chronic lack of variety and can in no way compete with online gambling. "It's not that we deliberately violate the law by turning to illegal gambling," he said. "There is just much more choice (on what you can bet on) and it's more fun to play." Lottery ticket sales hit 63 billion yuan in the first five months of this year, up 22.8 percent over the same period in 2009, showed figures released by the Ministry of Finance on Saturday. The sports lottery accounted for 26 billion yuan. However, the proportion of spending between legal lotteries and illegal gambling in China is 1:10, according to Wang Xuehong, executive director of the China Center for Lottery Studies at Peking University. She urged authorities to redress the balance by opening up and developing the country's lottery industry. "We should rethink the rationality of the current approach to illegal gambling," agreed Song Yunfeng, a member of the sport and law commission of the Beijing Lawyers' Association. "Like it or not, there is a huge demand from the public to bet on matches," he said. "We should start to think outside the box and find out ways to regulate gambling, rather than simply cracking down on it. It's impossible to stop." Under Chinese law, the crime of gambling carries a maximum of three years in prison, while someone convicted of operating a casino could spend up to a decade behind bars. Although some legal experts argue the punishments are too light, even harsher penalties would not deter bookies and their punters, Song said. "Many people see gambling as a lucrative business and will take the risk," he said, before suggesting that police time, money and resources could be better spent than on crackdowns to curb sports betting. "It is human nature to gamble, especially on something as popular as soccer games. If we cannot stop it, we should consider legalizing it so we can put it under strict public supervision," Song said. The legal wrangle over sports gambling and its potential impact on morality has stoked heated debate not only in China but also around the world. According to one school of thought, legalizing sports betting will lead to more gambling addicts and cause social problems in the long run. However, many countries have already started to acknowledge the gambling industry's positive contribution to tax revenue and employment levels. In Malaysia, where European soccer is extremely popular, authorities legalized sports betting this month, although no licenses were issued in time for the World Cup finals. However, the road to legalization in China "will be much more difficult because in Chinese culture, gambling is traditionally loathed for its degeneration of human nature and is considered extremely bad for the education of young people", said Song. "Chinese tend to think gambling, in whatever form, is never right," he said. "But we should recognize that gambling, if managed properly, can be turned into something good." Song said he believes opening up sports betting in China would help retain the large amount of money that otherwise flows to other countries, while the tax revenue could be used to promote and develop China's sports industry or support charitable causes. "It should not be a question of allowing or not allowing sports gambling, but how we regulate it so that we minimize the negative impacts and give full play to the positive side," said Feng Baiming, director of the center of lottery studies at Henan University of Finance and Economics, who is a well-known proponent of legalized sports betting. He suggested the authorities should gradually clear the way for sports betting by allowing more varieties of gambling, such as horse racing, which is already available in Hong Kong. China can learn from experiences of other countries by issuing licenses to selected organizations, he said. "In that way, it would be much easier to monitor and regulate the operators than if they are hidden underground or abroad." To prevent punters from going bankrupt, the government could even set a maximum stake, Song suggested. Bo Haibao, director of the School of Politics and Law at Shanghai Finance University, disagreed, however, and said maintaining social order should be the basis for any lawmaking. "In that sense, legalizing sports gambling would only ruin our social morality," he said. Also, despite the growing calls for legalization in some quarters, a general consensus among experts is that the current supervision system in China is not fit to ensure a healthy and successful sports gambling operation. Both lotteries running today - the sports lottery and welfare lottery - are managed by the Ministry of Finance and distributed by the Ministry of Civil Affairs and the General Administration of Sport. However, the difficulty in three parallel departments governing one sector is creating problems, say experts. "The most important thing is to have an independent supervision organ that effectively stems corruption and restores people's confidence in fair gaming and gambling," said Feng. "If not, the legalization of sports gambling would run greater risks of corruption." The reason why few people use the sports lottery to bet on domestic soccer matches is because people do not trust in the fairness of an administrative body that both regulates and benefits, he said. "The foul play and corruption exposed in the recent scandals are perfect examples," said Feng. "No one would dare put a bet on games after that." In response to calls to make the sports lottery more appealing to modern punters, officials unveiled three new varieties ahead of this year's World Cup. Wang Xuehong at Peking University said she believed the ban on sports gambling would eventually be lifted in China. "People in Hong Kong have been able to bet on soccer matches through the Hong Kong Jockey Club since 2003, when authorities decided to beat underground gambling rings," she told Southern Metropolis Weekly. "One day, sports gambling with fixed odds will also become legal on the mainland," she said.